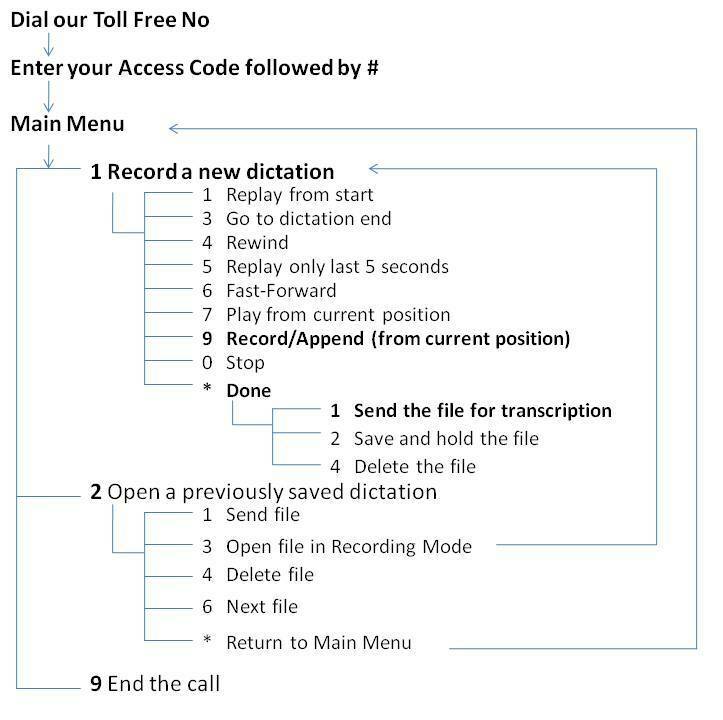 Here are the instructions for using our Dictation Recording System (DRS). Please print and give this to each dictator along with one access code. Main toll free number and alternate numbers: as provided by email and inside Support section of web portal. Further, we have provided the detailed command guide for the DRS. This can be given to the IT Savvy users who need to access fancy commands all the time. Most dictators prefer to dictate many reports in one call. After dialing the toll free number enter your access code followed by the # key. Keep repeating this sequence of commands to record as many dictations as you wish, without having to hang up. We strongly recommend that callers send one dictation each per report/patient. Remember to send files (press * and then press 1) and disconnect (press 9) before hanging up. Once you get used to the system, you need not wait for the entire system announcements to finish. Simply press the relevant option(s) to proceed further. While recording a dictation you may need to pause for a while. Press 0 to stop (pause) your dictation midway. The system will announce "Stopped, Press '9' to continue recording". "Stopped, Press '0', for more time. If you do not press '0' this call will disconnect in 20 seconds." Some dictators need to dictate a file partially and call again later to finish it. Now you have recorded a partial dictation and saved it (but not sent it for transcription) and want to call and connect to DRS to continue (append) that file.